and new this year, Hot 40 Restaurants in the U.S. – reveals the most buzz-worthy restaurants around the country. Discover the restaurants that have earned awards by viewing either an exclusive video interview with the chef or a photo gallery that includes pictures of the chef, the restaurant and the food. The issue also includes an examination of the major Culinary Trends for 2013. 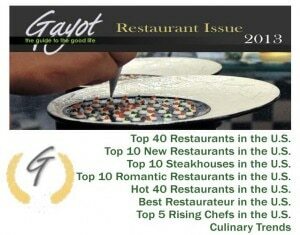 We hope you enjoy the GAYOT 2013 Restaurant Issue!